Once upon a time, cars were made with metal, but those days are gone forever. There are more and more plastic parts in today’s cars. Everybody sees them in the interior, but they’re also under the hood. Plastic parts arrived with air ducts, they’re now coming to engine mounts. Those are usually rubber-metal constructions, with heavy metal to support the high stress coming from engine vibrations. ZF engineers have been working hard to make them lighter, that required looking at new materials. They thought of plastics, and they designed a fiber-glass reinforced polyamide. 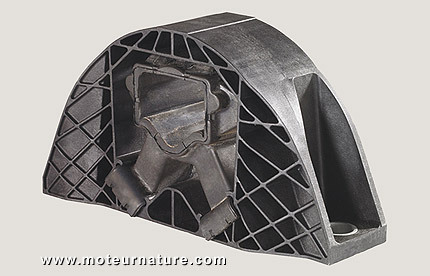 New engine mount is 25% lighter, insensitive to corrosion and fully recyclable. The Renault-Nissan alliance has been convinced, it will equip future models with those plastic engine mounts. But only smaller models. ZF says they are appropriate only for small cars or compacts. Large engines still require classic rubber-metal engine mounts.